I made a sidetable for the living room in Erlenhof. The ornaments are made from Dress It Up embellishments. Koristeet on tehty Dress It Up -koristeista. 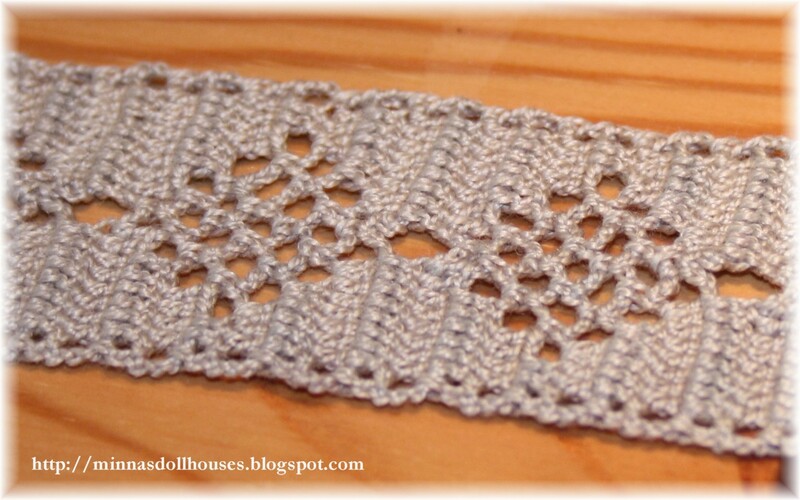 I crocheted the table runner by adapting one of the crochet patterns in Hildegard Åstrand's book Lace Crochet. 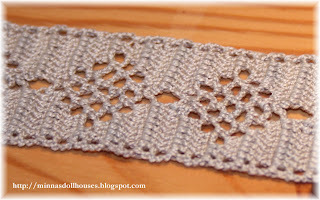 The book has several patterns for narrow laces which are suitable for crocheting miniature table runners, curtains, shawls etc. Pöytäliinan virkkasin soveltamalla yhtä Hildegard Åstrandin Pitsinvirkkaus-kirjan ohjetta. Kirjassa on paljon malleja kapeisiin pitseihin, jotka sopivat hyvin nukkekodin pöytäliinoiksi, verhoiksi, huiveiksi ym. Hieno pöytä ja pöytäliina myös! Your side table is beautiful. I love the runner. Great job Minna. Have to love that runner. I remember my mom having runners on all her tables. 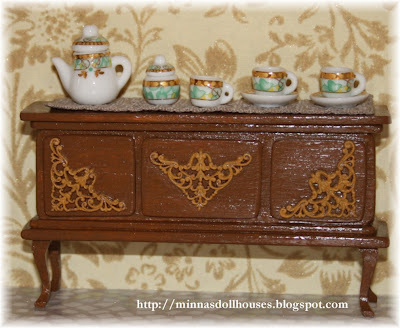 Great blog - love the variety! Vous êtes très doué pour le crochet et j'aimerai pouvoir en faire autant!! Love the fancy work on your sideboard Minna. I LOVE LOVE LOVE the table runner and it's exactly what I've been looking for. I tried to look for the book, but I can't read the language the book is in. Is there a way you can create the pattern you did and send it to me in English?